I've owned my PSP for a little over a year. I spent some time on a couple good titles, but overall, I find my Nintendo SP or, more recently, my DS have gotten way more mileage in my handheld gaming time. 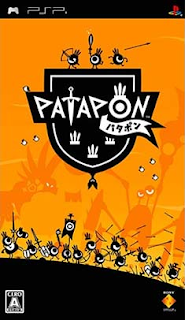 However, the game Patapon that was released in the US on Feb. 26, 2008 had been holding my attention and calling my name when I'm not playing. The game was developed by Pyramid and produced by Japan Studios, the same geniuses who brought us Loco Roco in 2006. It's a rhythm game in which each of the 4 buttons represents a different drum and you command an army of little eyeball dudes called Patapons to fight depending on the 4 beat pattern you play on the drums. The first two that you learn make the army march forward (Pata Pata Pata Pon) and attack (Pon Pon Pata Pon.) The army will then repeat the pattern while acting out the command. After their turn, you need to give your next order. If you maintain the rhythm sucessfully you will build up combinations and eventually reach Fever Mode which causes your Patapons to have more speed and strength and their attacks are much more effective. The enemies you kill drop weapons, money (ka-ching) and other loot that will allow you to build up your army and to eventually get new drums and skills. The game is a lot of fun. I enjoy using the items I collect to create new variations on my Patapons and trying out their skills. It's pretty easy to pick up and play, there is a storyline involved in which the Patapons are looking for something called IT at Earthend, but the story doesn't bog you down and you don't even really need to follow the story to enjoy the game. The only downside I see is that it's difficult to play with music or the television on in the background. I highly recommend this game for anyone. It's cute and kid friendly, but challenging and interesting for adults as well.